DONALD Trump has warned Iran will face “bigger problems than they have ever had before” if Tehran decides to restart its nuclear programme, as tensions in the Middle East continue to escalate. During French President Emmanuel Macron’s state visit this afternoon, Mr Trump also blasted the nuclear accord with Iran as “insane”. Mr Macron, along with Theresa May and Angela Merkel, has urged the US to honour its commitment to the deal. President Donald J. Trump has hit out at what he describes as the pact’s “terrible flaws”. The President has insisted the deal goes too easy on Iran at a time when Tehran is continuing to pursue more powerful arms as well as building tensions in the Middle East, including both the civil wars in Syria and Yemen. 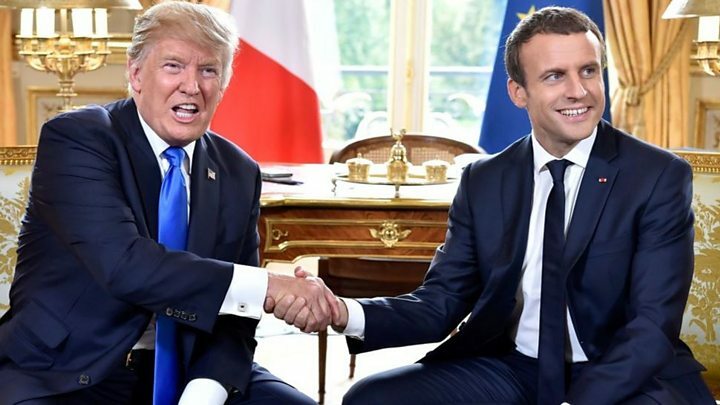 But after meeting with his French Counterpart, President Trump signalled the Iran deal could survive, if only by the skin of its teeth. He said: "I think we really had some substantive talks on Iran. And we're looking forward to doing Something. "We could have at least an agreement among ourselves very quickly. I think we're fairly close to understanding each other." Emmanuel Macron travelled to Washington in the hope of convincing his US counterpart to stick with the Iran deal, despite its many flaws. He told Mr Trump the accord is part of a "broader picture" of security in region. With no sign of Iran slowing down its race to modernize its military capability’s only time will tell how this ticking time bomb will pay out. Read: "Labour candidate described as the 'next Diane Abbott' in massive controversy"
Read: "Apparently now the English flag is racist too!"